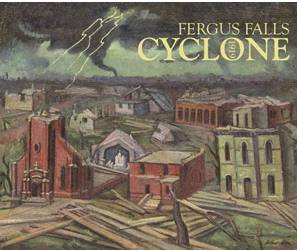 100 years ago, a cyclone/tornado devasted Fergus Falls. Visit the special exhibit at the Otter Tail County Historical Society Museum now through December. Find out more about what was happening in Fergus Falls and the world in 1919. View photographs that were taken immediately following the storm. View a map of the business and residential areas that were affected by the storm. Hear the voices of individuals who were interviewed about the storm 60 years after the event. See what was built after the storm to create a "Bigger and Better Fergus Falls". Storm Spotter Training with SkyWarn Storm Team and Otter Tail County Emergency Management. Fergus Falls Public Library. Admission is FREE. The Great Fergus Falls Cyclone Slide Show Presentation 7 pm, Lance Johnson @ OTCHS: The author of the 1982 book The Great Fergus Falls Cyclone of June 22, 1919, Lance Johnson will present his well-known, vintage slike presentation on the history of the tornado. There is no greater authority on the storm than Lance Johnson. Admission is free. Tour of Oak Grove Cemetery, 7pm Get to know the people who experienced the storm - the survivors, victims and those who rebuilt the community. This tour explores the lives of people directly affected by the tornado. Admission $6. Artist Reception for Jenny Field Opheim, 5-6pm with a discussion of a special piece created to commemorate the tornado. Otter Tail County Historical Society Museum. Downtown Fergus Falls Mystery Tour, 8pm This tour will highlight some of the enduring legends of the 1919 tornado. Due to the content of the material, the Downtown Mystery Tour may not be suitable for young children. Meet at River Inn. Admission is $6 for Museum members, $10 general public. Includes FREE Dairyland Cyclones.